Prize DrawsWin a selection of Greeting Cards and Notelets worth £50! Win a selection of Greeting Cards and Notelets worth £50! 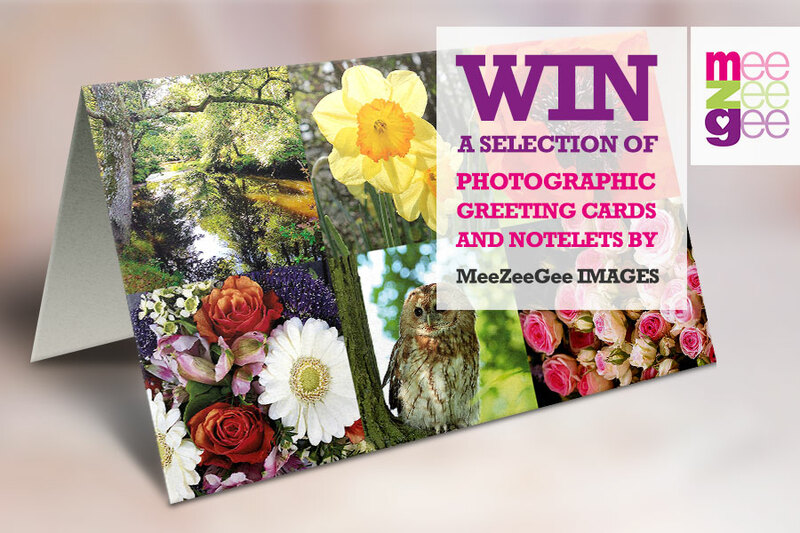 This month you could be in with a chance of winning a selection of Greeting Cards and Notelets worth £50 from our friends at MeeZeeGee Images! MeeZeeGee Images started publishing photographic greeting cards just five years ago and now has an enormous range from animals, cats and dogs to an amazing collection of flowers and nature, made in the UK. They are all taken by either MeeZeeGee (Maresa Crook) or husband Chris and a few by friends who let her use their special images. You can use these lovely blank cards to send to friends or relations for any occasion, or even instead of a letter. MeeZeeGee cards are sold widely in Great Britain and abroad and are offering a lovely Spring bundle for you to send, of the best designs we offer. MeeZeeGee would like to give away a selection of 35 best-selling greetings cards, and four packs of notelets to one lucky winner! The giveaway also includes a calendar for you to enjoy for 2017. Look beautiful, reminded me I need to get one for my sister in law! Lovely prize, I use so many greetings cards and notelets throughout the year! Ideal for keeping in touch with friends and family. Whew! Got in just in time! I like receiving cards rather than an e-mail, definitely more personal. It is nice to write notes to friends and family. I'm one of the older generation who still enjoys writing and receiving cards and letters so some beautiful cards are always appreciated. I will send you a thank you card if I win!!!! A great prize. Thank you. Always handy to have a stock of very smart cards. What a saving. They look stunning. Living out in the 'sticks', miles from the shops, these would be really useful. I would love to get the cards etc, we live so far from the shops, I do like to write to people, so they would be very much appreciated. Great prize saves me going to the shops to buy. It is always good to have greetings cards at hand. These would be useful to me. How nice ! REAALY APPRECIATE THESE PRETTY CARDS. Would be good to have these handy when required. These cards are lovely. Great prize to win. always useful to have some spare pretty cards ! always useful to have some pretty cards in store ! Beautiful cards, what a useful prize..i would love to win these. With family and friends all over the country these would always come in very handy. Better than texting someone. It's always good to have a selection of cards for that occasion that you might forget. These look beautiful - my card box does not contain any of this quality and is getting low. always handy to have a stock of cards. I would love to have lovely cards to send to family and friends to brighten their day. I would donate this to a Care Home or a Disabled Group. It's such a lovely prize to give someone who is sick or feeling down. A card or notelet makes a lot of difference. Receiving a greeting card is a joy....as is sending them. Anyone would love to receive one of these beautiful cards! Lovely and very useful prize. Always keep a card box ,so this would be brilliant . It is always good to have a few cards in store you neverknow when you might need one and it saves the extra shopping. Choosing the right card for someone is never easy. How lovely for someone to have done the hard work for you. I love stationery and beautiful cards in particular. Beautiful colors and designs, a personal message to send to your friends and loved ones. Lovely generous prize --thanks for the chance to win. The art of letter writing should never be allowed to go out of fashion... ever! What lovely cards, will be happy to send these to my friends and relatives. Love Silversurfers, laughs, and good offers. This prize draw is amazing, to get a chance of these cards is a privilege. Thank you. Love these type of cards. Much nicer to write your own message. Cards like this are always useful. With family all over the world these would be so useful. How lovely to have these to hand they are so delightful.Fingers crossed. Will come in very handy for ALL my competitions. Good luck to All, always handy yo have a back up of Greeting cards and Note-lets for that Special occasion. My wife makes cards for friends and family. I feel sure she would love to receive this prize. What a wonderful selection to have to hand for those special occasions. I do need to stock up my stash for those days when I can't leave the house and birthday etc is due. Love stationery! Always have done and this looks wonderful! Right up my street! Love the look of these cards fingers and toes crossed. Love sending cards for occasions and these are so attractive, a lovely prize. Would be a nice alternative to the normal greetings cards. Old school,still like to receive and send cards,letters.Too much texting and Facebook,nothing like a card to cheer your day. I have a beautiful Cross fountain pen that would love to meet up with these lovely cards and spread a little inky happiness around. As most of my friends send text messages i would love to win this prize so that i can start to turnaround this lazy trend and hopefully get them to realise how lovely it is to correspond with a handwritten card, as we always did before texting took over our lives. Beautiful cards I can send to friends and family all around the world from Canada to Thailand. Wonderful prize. Thank you for the chance. Agh this beautiful stationary waiting for the written word of kindness or and greetings to another. I wish. Would love to win this prize. Cards can be so expensive here in France and often a little dull. (Excluding those that are hand made by others). Great prize. Beautiful cards which are just shouting out to be sent to friends and family. Bring back the art of handwriting and these will certainly encourage anyone to take pen to paper! Thank you for the opportunity to enter the competition. Why do so many people just send e-mails or texts now, would much prefer to receive a beautiful card so, if I am lucky enough to win, can send them to friends and perhaps they will get the message!!. The cards look lovely ! Fingers crossed. How wonderful, beautiful cards for everyone. Beautiful cards just right for every occasion. How delightfully pretty the cards are. It is always nice to receive a card whatever the occasion. What beautiful cards, these would be a pleasure to send and what an honour to receive them !! Would love to win this fab prize..
keeping the art of writing alive. I'm getting married soon so I could use these to thank everyone ! What an amazing prize. March is always a busy birthday month. I like having a stock of pretty cards to send as thank you notes - much nicer to receive than a text or email I think. I Love new Stationery Items. These cards/notelets look really beautiful.